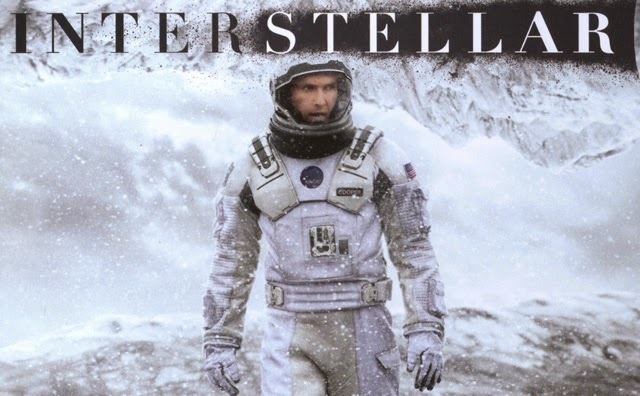 INTERSTELLAR DVD Review | Warped Factor - Words in the Key of Geek. 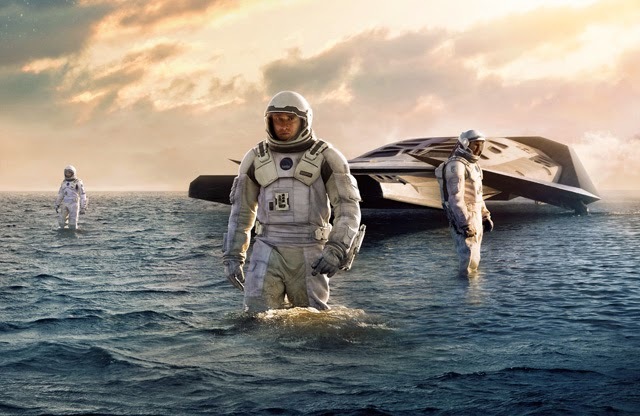 Recently released on DVD, Matthew Kresal reviews Interstellar. I must confess that I've been interested in Interstellar since I saw the teaser trailer for it released towards the end of 2013. I've been keen on space exploration since childhood, a side-effect I suspect of growing up near NASA's Marshall Spaceflight Center where the Saturn V rockets of the Apollo era were designed and where NASA continues to do work. Also being something of a fan of Christopher Nolan's previous movies, the idea of him doing a space film was something that seemed irresistible. 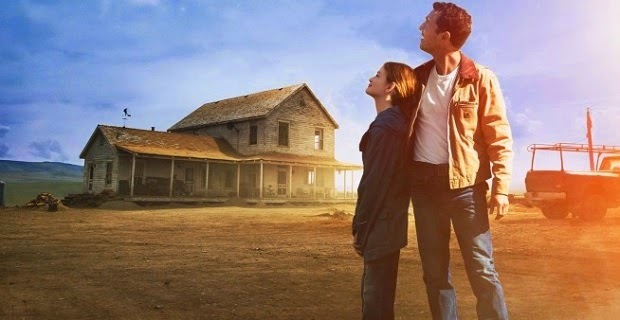 I'm happy to say that, after two viewings in cinemas and one via the recent home video release, Interstellar is a film that not only didn't disappoint but improves with each new viewing. The result being that it could well be the best science fiction film in recent memory. Interstellar is in some respects several films in one, not unlike Stanley Kubrick's 2001: A Space Odyssey was, but with the difference being that here the plots are all connected via the character of Cooper, played by Matthew McConaughey. Cooper is a former pilot and NASA astronaut turned farmer in a world sometime in what seems to be a not too distant future where technological progress has come to a halt, food resources are becoming scarcer thanks to a blight and a disaster not unlike the Dust Bowl of the 1930s, which has caused society to revert to a slightly more technological take on the agrarian societies of the past. It's a world filled with what one character calls “a caretaker generation”, something that Cooper ill-fits into. A series of anomalies though, including a “ghost” knocking books off the shelves in the room of Cooper's daughter Murphy (played by young Mackenzie Foy) leads him to a NASA being led in secret by Professor Brand (played by Nolan stalwart Michael Caine). Brand and NASA, having discovered that the blight will eventually lead to humanity's extinction, are preparing to launch an expedition through a mysteriously place wormhole out near Saturn that leads to another galaxy with three potential worlds for humanity to settle. 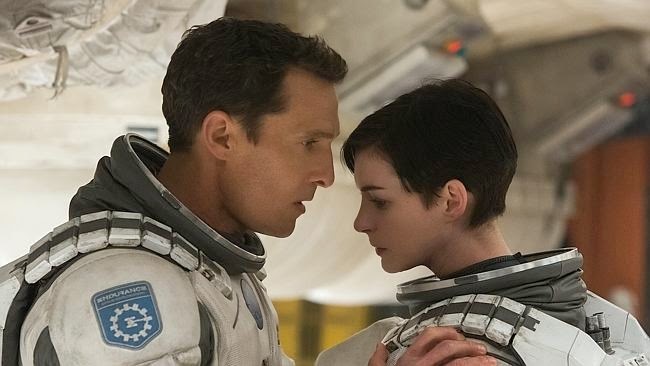 Alongside a group of astronauts including Brand's daughter Amelia (played by Anne Hathaway), Cooper and the viewer launch off on an odyssey that takes them and us to another galaxy. Once there though, Cooper and Amelia must deal with the facts behind the theory of relativity, our own human weaknesses and a surprising turn of events involving the now grown Murph (played by Jessica Chastain) that will determine the future of humanity. Those familiar with Nolan's work may be surprised that the man who brought us perhaps cinema's most successful take on Batman and films like Inception would be interested in taking us out into the realms of interstellar space. Yet this movie contains many of the hallmarks of Nolan's films which makes it something that only he could create. It certainly has the epic scale we've come to expect from Nolan's recent films, as the viewer is taken from agrarian future Earth, to NASA's base, to on board the spacecraft Endurance, and to planets in another galaxy, as well as showing Nolan's ability to take often difficult ideas and ground them in a reality which viewers can understand. Nolan, speaking in the 2011 documentary These Amazing Shadows, talked about liking films that make the audience come back again and again, for which he specifically cited Kubrick's 2001, Interstellar most certainly falls into that category. That's partly because Nolan makes use of one of his favorite storytelling techniques, one that he's used in films throughout his career including Following and Memento: non-linear storytelling. Nolan, along with his co-writer brother Jonathan, ground the film within the real-life theory of relativity and its implications upon the astronauts during their mission, something that becomes increasingly important as the film progresses. That non-linear storytelling also becomes a strong emotional force late in the film as we see father and daughter, one in space and one on Earth, struggling to overcome difficulties as each tries to carry out their end of the plan to save humanity. Yet where that non-linear plotting comes to the fore is with the films ending, which, I must confess, upon first viewing left me initially wondering if Doctor Who writer Steven Moffat had taken a pass at the script. All of this has served to confuse some viewers and downright aggravate others as the film raises many questions. The film though invites viewers, much like 2001 before it, to come back to it again and again in search of answers. Those willing to return to Intersteelar will find much to appreciate about it. There's the performances from the entire cast for example. I rarely think that a film is perfectly cast but Interstellar is one of those rare occasions where I think that's fair to say. Nolan's films tend to be well cast affairs anyway, but with an ensemble including McConaughey, Caine, Hathaway and Chastain in major roles with Foy, Casey Affleck, John Lithgow, Ellen Burstyn and Matt Damon in supporting roles, it's hard to find a single part miscast here or to imagine anyone else in those roles. McConaughey's performance is especially powerful, with it being more than equal to his Oscar winning role in 2013's Dallas Buyers Club. Mention must also be made of the trio of actresses playing Murph which includes Foy and Chastain as they become the film's emotional anchor to the Earth once Cooper launches out into space. Production wise there is plenty to be impressed by. The film's five Oscar nomination, and sole win, all were for production values and it isn't hard to see why. There's the Oscar winning special effects that, thanks to the input of science consultant Kip Thorne, present us with an as-accurate-as-possible journey through a wormhole, as well as distant planets and a trip to that strangest of all phenomenon: a black hole. The special effects also extend to the Endurance spacecraft and the smaller Rangers which must be models and sets because they have a reality and a weight to them as it were, the kind that most CGI I've seen still isn't quite capable of presenting. There's some fantastic production design work covering a wide range of sets and locations which presents us with the most credible depiction of a near-future you're likely to see anytime soon. Yet what makes Interstellar stand out from a film like 2001 is its script. 2001, despite some of its big ideas and breath taking visuals is at times a cold and clinical film where the most human character is the computer HAL. Interstellar definitely has its share of striking visuals and fascinating scientific concepts (explored in much greater depth in The Science Of Interstellar by the films science consultant Kip Thorne) but that's not really what the movie is about at an emotional level. The film explores humanity's place not just on this pale blue dot but out in the universe, from our potential as a species to that fight or flight reflex that leads some of us to do incredible things and others to commit terrible acts of cowardice (something that makes me think that the name of Matt Damon's character is no accident). Interstellar speaks to what drives us and asks what we are capable of, telling us that (to paraphrase a line from the film's first teaser trailer) our greatest accomplishments are still waiting for us out there somewhere, and that, in the words of the Welsh poet Dylan Thomas that becomes almost a refrain throughout the film, we should not go gentle into that good night and rage, rage against the dying of the light. Interstellar shows that we can, and that we might just do it too.